Oli Hazzard's Blotter consists of five sequences, each constructed using a different process. In "Graig Syfyrddin" notes on hillwalking in the Welsh marches – the poet's former home – alternate with found text taken from an online walking forum. "Blotter" is a shepherd's calendar of sonnets composed of Russian spambot script – a mix of lifestyle advice, gaming tips, authoritarian propaganda, bucolic fragments and apocalyptic messages. "Within Habit" is a series of prose poems collaged from numerous sources. "March and May" comprises parallel columns of verse. "Or As" is a family of 81 seventeen-syllable poems, each one an erasure of the corresponding page in a different book the poet was writing alongside Blotter. The poems are preoccupied, above all, with the passage of time, and how that passage can be differently registered or disturbed: the working day, the distorted seasons, the timestamp of a text message, the jottings of a daybook, the formal structure of a shepherd's calendar, the double exposure of a photograph, the reverse-flow of a Twitter feed. 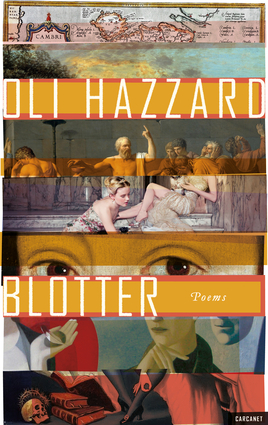 The title, Blotter, connects these concerns, suggesting at once a police blotter, a journal, a thing for drying wet spots, and, in its painterly connotation, a way of rendering the world in a manner that is vague, blurred, or out of focus. Oli Hazzard was born in Bristol in 1986, and studied English at University College London and the University of Bristol. He has researched John Ashbery's poetry at the University of Oxford. Oli Hazzard's poetry has appeared in magazines and anthologies including The Forward Book of Poetry 2010, Best British Poetry 2011, The Salt Book of Younger Poets and New Poetries V (Carcanet, 2011). He now teaches at the University of St Andrews and lives in Edinburgh.